Captain Colin Montgomerie, left, with Saturday's playing partner Simon Dyson during their fourballs victory. 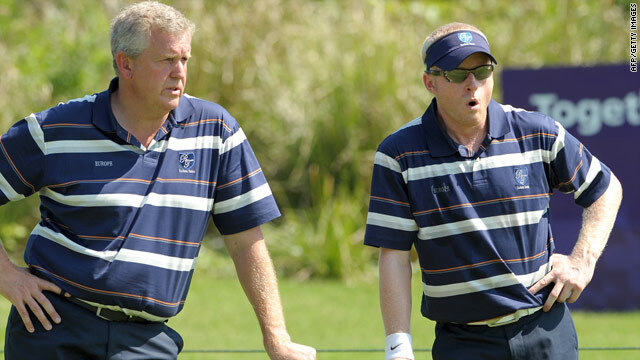 (CNN) -- Colin Montgomerie's Europe team have battled back to take a 4.5-3.5 lead over Asia into the final day of the Royal Trophy in Thailand. The Europeans had trailed 2.5-1.5 after Friday's opening foursomes, but won three of the four fourballs on Saturday to give them a slight advantage going into the closing singles matches in Bangkok. Captain Montgomerie changed the line-ups successfully, pairing himself with Englishman Simon Dyson to defeat Indian duo Jeev Milkha Singh and Gaganjeet Bhullar 4 and 3. The Swedish combination of Robert Karlsson and Alexander Noren, who claimed Europe's only win on Friday, thrashed Japan's Ryo Ishikawa and Koumei Oda 6 and 4. Sweden's Peter Hanson and Danish golfer Soren Kjeldsen lost 5 and 4 to South Korea's Charlie Wi and China's Liang Wen-chong, but Henrik Stenson and Spaniard Pablo Martin won 3 and 1 against Thailand's Thongchai Jaidee and Prayad Marksaeng in the final match. The Thai duo were unbeaten in last year's tournament as Asia, captained then and now by Japan's Joe Ozaki, triumphed 10-6 -- and they also won their match on Friday. "That was big -- it was a tough game, a good game, and I am pleased my partner and myself could finish it off as we did," said Sweden's world No. 7 Stenson. "It means we go into the singles with a narrow lead, and it's looking good." Europe won the event in its inaugural year in 2006 and again in 2007, but it was canceled in 2008 due to the death of the Thai king's sister. Meanwhile, a South African player seems set to clinch victory at the European Tour's African Open on Sunday after the host nation filled the top five slots on the leaderboard going into the final 18 holes. Halfway leader Trevor Fisher Jnr shot two-under-par 71 on Saturday, and was caught at the top by Thomas Aiken at East London on the Eastern Cape. Aiken carded 69 to also be on 16-under 203 after three rounds, with compatriot Jbe' Kruger one shot back in third after a flawless, six-birdie 67. Charl Schwartzel (68) and Jake Roos (66) were tied for fourth on 205, with England's Miles Tunnicliff the top European another stroke back after his 67 left him level with another South African, Bradford Vaughan (70). Lucas Glover extended his lead to three shots at the halfway stage of the PGA Tour's season-opening event, the SBS Championship in Hawaii. The U.S. Open champion, who led by one stroke after the first round of the 28-man event, carded a eight-under-par 65 on Friday. Fellow American John Rollins shot 66 to be second on 134, with compatriots Sean O'Hair (67) and Matt Kuchar (68) a shot back tied with Britain's Martin Laird (68) and Australia's Geoff Ogilvy (66).